Home » analytics , Digital marketing , Google Analytics , marketing » Free Google Analytics certification: this is how to get it. 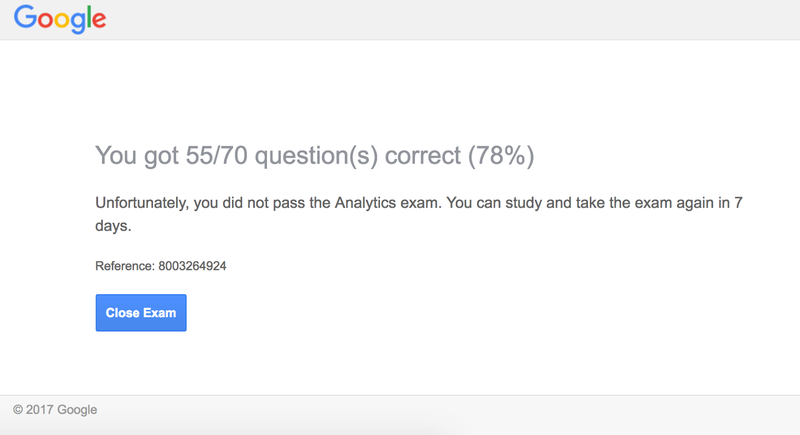 Free Google Analytics certification: this is how to get it. Did you know that in digital marketing you do not have to pay Harvard or MIT to get a marketing certificate that comes from a brand that is even more prestigious than these universities? You can thank Google for this! This post will walk you through how you can get a stamp from Google on your analytics skills. Certifications are a great way to demonstrate your skills and get a new job or a promotion. They are also a great way to test yourself and assess your skill level. Several great certifications are available for free! You should definitely work to get them if you are serious about digital marketing. In this post, I walk you step by step to get the Google Analytics main certifications easily. Here are the steps you need to follow to get a certification signed by the first brand in the world on you CV, for free. Thank you, Google! Take the practice questions provided by Google first. That way you will identify the gaps in your knowledge and be able to focus your preparation on what you do not know yet. There are additional practice questions on the e-commerce analytics, have a look to them! The Google Partners page includes great training videos and study notes for the certification. Go through them and you will be ready for the Google Analytics Personal Certification. In particular, the Google Academy content is a great resource to learn all you need to know to get the Google analytics certification. The study notes are permitted during the actual certification exam. So, keep open a tab with the Google Analytics help center during the exam, and another one with Google AdWords help. And if you have decided to prepare the certification with the notes below, keep the post open. It includes a link to the most relevant pages of Google Analytics help. I strongly advise you to go through all Google Academy's material: watch the full series of video. I tried the certification exam too quickly and had the frustrating experience of being exactly below the passing grade. That's quite frustrating! To further support you in getting the Google Analytics free certification, this post details my study notes. 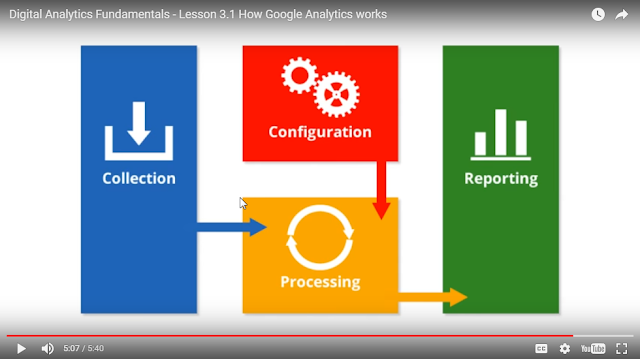 The Key Concepts of Google Analytics? Analytics is about: (1) Measuring behavior, (2) reporting it, (3) analyzing the gathered data to improve the business results, (4) testing solutions to increase the business results, (5) starting over. Google Analytics Data model relies on the following hierarchy: users > sessions > interactions. Segmenting the data is key to derive actionable conclusions for your business. For instance, you may segment the date by date/time to find out if you sell more on Mondays. Classical segments used in Google analytics are the following: date/time, device, marketing channel, geography, and customer characteristics. In Google analytics lingo, the segmentations is made according to dimensions. Putting the data into context the data is key to understand the data correctly. An important external context factor is to monitor the competition activities. An example of internal context information is the history of your sales. Bounce rate is the percentage of pages that receive a single interaction from the visitor before he or she leaves the site. The business objectives are measured by tracking some actions of the users on the website or app. Actions that indicate the business objective is completed are called Macro-conversions. For instance, a cart validation and payment on the website is a clear macro action. Micro-conversions are all other actions that bring the audience one step closer to the business goal. For instance, a customer signing up for information about promotions is a step towards making a purchase. Attribution is the fact of giving credit to marketing actions for the conversions you get: for instance if you pay for ads, and they lead to sales. Last click attribution is the simplest attribution method: it'consists in considering that the last ad the person clicked has full credit for the sale. There are other attribution methods. They permit to estimate the value of each channel and define your marketing budget. The stages of a digital sale funnel are the following according to Google: awareness > acquisition > engagement > conversion. Beware other companies have different definitions as you can learn in my tips to get the great inbound marketing certification from Hubspot. These notes will help you get the basics rights and you can use them as a cheat-sheet for the exam (notes are permitted). But once again, watch the google academy's videos, that's the best way to learn and prepare for the certification. Good luck! And do not forget: sharing is caring. If you like this blog, a social media share or a LinkedIn connection request will be highly appreciated. Thanks!